The president was responding to McCain's comments in which he complained that the health care bill was not produced in the open, but "behind closed doors." He pointed to a number of issues, including the PhRMA deal and a provision mandating $100 million for a Connecticut hospital, asking "why should that happen?" At one point, Mr. Obama tried to interject. 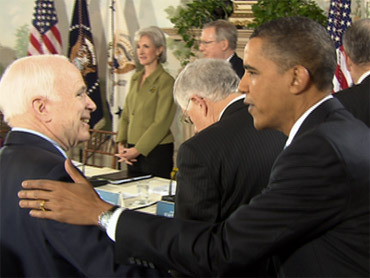 "Can I just finish, please," McCain said, cutting off the president. "People are angry," McCain said. "We promised them change in Washington, and what we got was a process that you and I both said we would change." He called on Democrats to "go back to the beginning" and "remove all the special deals for the special interests and the favored few," adding that he favors a system in which "geography does not dictate what kind of health care." A visibly annoyed Mr. Obama immediately responded, saying "we can spend the remainder of the time with our respective talking points going back and forth. We were supposed to be talking about insurance." The president said that he did not want to have Democrats address McCain's objections and get bogged down in old arguments. "My concern is that if we do that we're essentially back on Fox News or NSMBC on the split screen just arguing back and forth," he said. "So my hope would be that we can just focus on the issues of how we get a bill done." Mr. Obama added that "the way you characterized" the bill would "obviously" prompt complaints from Democrats. "We can have a debate about process or we can have a debate about how we're going to help the American people at this point," said the president. "And the latter debate is the one I think they care about a little bit more." Obama Urges Republicans to Do Some "Soul Searching"